Hey guys! I wanted to take a moment to apologize for the lack of recipe posts last week. We had a lot going on all at the same time, I am sure most of you can relate! Over the next week, we are going to concentrate on bringing you recipes that will be perfect to share with your meat eating or veggie family and friends this holiday season. This recipe actually came to me on accident. The other night I was talking to on of our writers, Dahlia, about the groceries I had just purchased. One of the things I had purchased on a whim was Brussel Sprouts. I had only had them one time before and was not a big fan. After asking Dahlia what how I should cook them,she said that her favorite way was to eat them with a honey mustard sauce. As yummy as this sounded, I no longer eat honey. So that is when it came to me, I would try to make with pure maple syrup instead. This is a replacement I use frequently for honey in recipes. After throwing it together, I thought how delicious would this be with a Thanksgiving spread? Needless to say, this is one of my go-to recipes now! 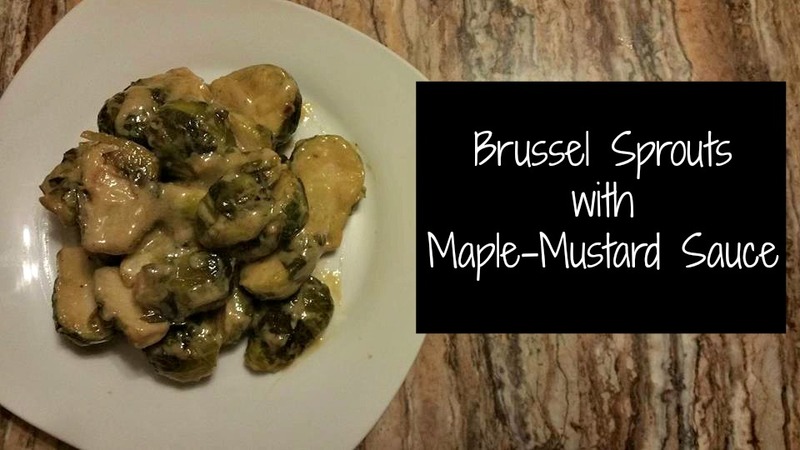 A few things about this recipe, I used fresh Brussel Sprouts, but I am sure frozen would work just as well. My only suggestion would be to not cut them while frozen. Let them thaw out first. I love garlic and add it in to most recipes, but if you aren't crazy about it, it can simply be left out of this recipe. Also, I realize that the vinegar along with the mustard may seem like a bit much, but the extra zing it adds really makes the whole thing, but again if it's not your thing you can add a bit less to it. What are your favorite ways to eat Brussel Sprouts? Ever try something that didn't work at all? Did you love this recipe? Did you hate it? Have any requests on recipes we should do in the future? Let us know in the comments! If you use this recipe or even put your own spin on it take a picture and tag us in it on Facebook at The Smoothie Vegetarians, or tag us on Instagram @smoothievegetarians or Twitter @smoothievegies! Wash and cut your Brussel sprouts. I like to cut them in half but you do not need to do this. Sauteed Brussel sprouts in cooking oil until fork tender. While Brussel Sprouts are cooking mix dijon mustard, maple syrup, garlic, vinegar, salt, and pepper in separate bowl. After Brussel Sprouts are finished cooking, take them off of the heat and add the sauce to it.